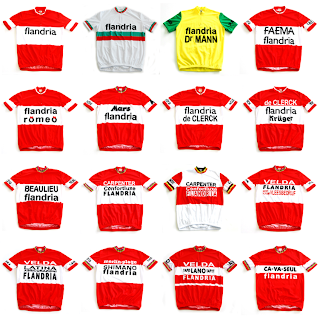 The greatest cycling team ever? You'll get a lot of debate over that one. Every era has its usual suspects. The 60's? St. Raphael (Anquetil/ Stablinski/ Darrigade/ Saint/ Riviere/Elliott)? Peugeot (Simpson/Merckx/Pingeon/Bracke)? Salvarani (Gimondi/Adorni/Altig)? 70's? How 'bout Molteni (Eddy Merckx/Bruyere/Swerts)? Mercier (Poulidor)? Kas? Bianchi? The 80's? The Dutch TI Raleigh squad (Raas, Knetemann, Zoetemelk)? Renault-Gitane(Hinault/Fignon/LeMond/ Madiot)? Or maybe LaVie Claire (Hinault/ Lemond/Bauer)? 90's? Had to be Mapei (Rominger/Museeuw/Tafi/VDB/Ballerini) or was it Miguel Indurain's Banesto? The past decade that saw Lance's Postal juggernaut morph into Discovery and then Astana? Or CSC/Saxo Bank? Well, I submit there's one team that rises above all on a number of criteria. Flandria. ‘Wielercafe’.That’s what this blog is... a virtual wielercafe. Pity we don’t have wielercafes here in the States. Belgium has about 20 times as many as they have beer brands - and there's literally hundreds of those. 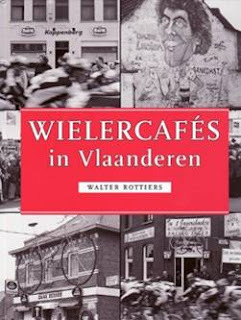 The 'Wielercafe' is the crucible of Flemish cycling culture. They even print a guide book for them. They're a cross between a coffee house and an Irish pub. Beer's the beverage of choice, and cycling the main subject of conversation. In bike-crazy Flanders, it's like what Tip O'Neill said about politics: 'All wielersport is local'. The wielercafe organizes the local kermesse races. Serves as the 'supporterslokaal' where elders pass the hat to raise funds for the local hotshot hopeful.